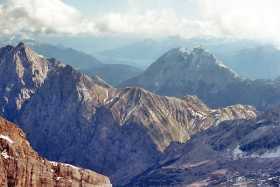 The Zugspitze is the highest mountain in Germany, and can be found in the Bavarian Alps, straddling the border with Austria. The eastern summit is 9731ft/2966m high. 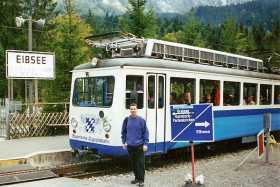 After getting over the shock of the expensive ticket price, I took the Bayerische Zugspitzbahn from Eibsee to the summit. First you ascend the mountain by rack railway, which takes about 45 minutes through a long tunnel, to reach the Schneefernerhaus (8695ft/2650m). 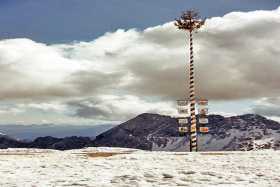 Stepping outside, suddenly the high cost is forgotten as you are greeted by cool fresh air, dazzling white snow, a terrific mountain vista, and the good old Bavarian maypole proudly standing in the clouds. 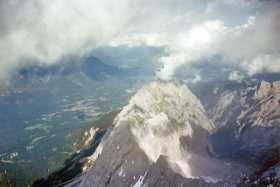 To reach the summit of Zugspitze, you must now take a short journey by cable car. 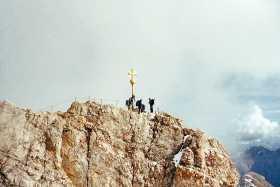 At the top of Germany, you can see the gilded iron cross on the eastern summit. 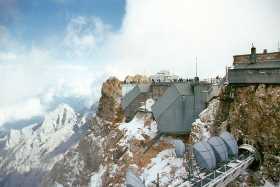 The fantastic ranges of the Alps are laid out before you, clouds zipping across the summit, sometimes obscuring all view. The town of Garmisch - Partenkirchen looks pretty small from here, lying towards the north. To the south, you can see a valley in near-by Austria through gaps in the mountains.